I really like the linear part. Such a clean lead in to the concept they’ll use. 0. Slide 4, justify quadratic via gravity? or no? leave to teacher? 2. Analyze slides– encourage more descriptive predictions? Prediction slides just asked for “in or out”. But, with the quadratic fit, wont students have more precise things to say? Backboard? rim? miss side to side? I’ve had students say these things on paper when i’ve used your lesson and it was powerful to have them say very detailed things because they were comfortable that they were not going to be judged for accuracy. Often the students with lower grades would speak more here. It’s wonderful. Thanks for sharing. I enjoy how you are always innovating! Here is a Zaption (interactive video) I use to demo the tool and showcase your video shorts. Regarding what Howard said, I worry a little that this activity reinforces students’ misconception that a graph of motion is a picture of the path that the object took. You see this misconception in Function Carnival a lot. Of course, here you are graphing Y vs X, not Y vs T, so it truly is a picture of the motion. But I wonder if you could have an extension that shows that quadratic equations are also useful to model Y vs T for a ball that has simply been dropped. You wouldn’t need to get into Newton’s laws and gravity. You could just show that the y-motion is independent of the x-motion, so even if it’s just dropping, you still get this quadratic relationship. And maybe you could predit the time at which it’ll hit the ground or something. I had no idea that you had reworked this lesson when I wrote my blog post, but coincidentally I just blogged about my intro to quadratics here. Following Kevin’s suggestions re plotting height and sideways displacement against time (assuming your shots are equally spaced in time, you could let them explore average speed between shots and see the surprise on their faces (hopefully). And less of a shock when meeting calculus. Vertical speed, that is ! Great point about the graph/picture possible misinterpretation. I agree you do see it in Function Carnival — and Function Carnival does a great job of dispelling that idea. A possible way to start small with that idea here would be to compare height v. x-pos (the current graph) and a height v. time graph. For airballs like shot 4, the graphs would look the same, except no yvals for t<0. Neat intro to quadratics that sets the stage to learn more about the equations that create these parabolas! Another idea: Since this is meant to be an introductory lesson to quadratics, maybe a second lesson could be made with activity builder that students could do after they had learned more about writing quadratic equations. Students could be given the same type of basketball pictures without the draggable parabola and be asked to write their own equation that they think best matches the ball path. They can use their own graph to make their predictions. No sliders please. They could be asked to enter their equations before moving on to the next picture. This activity would bring them back full circle to where they started the unit, but now they would have new tools to apply…. As others mentioned, vertical motion would be another (more difficult) way to go. 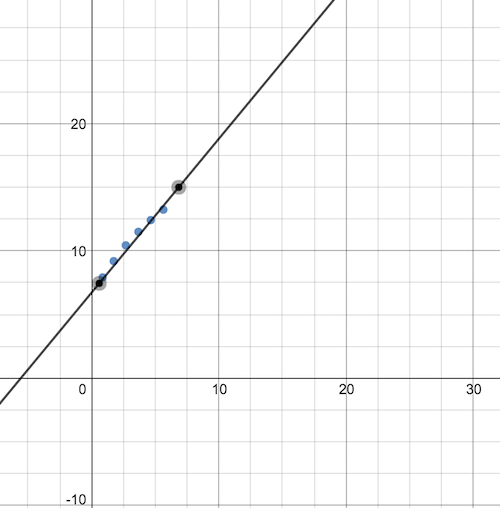 Here is a Desmos variation called will it hit the head, with the implied question being whether a brick moving vertically will cause a headache for the person moving horizontally. Drag the points to fit a quadratic again – but now the information we get is about when the brick will hit the ground. The more I think about this, the more curious I get about how people see this fitting into a broader quadratics unit. It’s an intro lesson, but I see two different topics you could use it to introduce: (A) You could first teach quadratic expressions, especially multiplying binomials and factoring trinomials, and *then* use this lesson to introduce quadratic functions and their graphs. Or (B) you could use this lesson before teaching quadratic expressions, to give kids some motivation for why we’re bothering with the rather difficult topics of multiplying and factoring in the first place. If you choose (A), this lesson seems great, but we need something else to motivate kids to study multiplying and factoring expressions first. I know you did a summer post about making a headache for which factoring could be the aspirin–and maybe that would be enough–but honestly what the community came up with there wasn’t nearly as engaging as Will It Hit The Hoop. Until kids see that quadratic expressions can model a huge swath of life, they might not see the point of the tedium involved in factoring. (In the blog post I referenced in my comment above, I talk about showing this huge swath of life as reaching a mathematical vista). Again, this is not a critique of Will It Hit The Hoop. It’s great! I’m asking where people see this excellent lesson fitting into a broader unit plan. If you choose (B), you’d be telling kids that Will It Hit The Hooop shows why expressions with x^2 are important and then stepping away from all the content of the lesson (parabolas) to go back and do factoring and multiplying. In this case, you may waste much of the learning that this lesson creates. The main math content of Will It Hit The Hoop is intuition for vertex form of a parabola. If you do the lesson and then retreat back to multiplying and factoring expressions, students may have forgotten this intuition by the time you return to parabolas. Perhaps there’s an option (C): teach parabolas with vertex form and standard form first, and then go back and do multiplying and factoring so you can study factored form of a parabola and find the zeros of the function. Probably throw the quadratic formula in at that point. I’ve never taught it that way, but I’m curious what others do/think. Done. Don’t want the selection of the new model to seem arbitrary. Analyze slides– encourage more descriptive predictions? I added “and why?” to the questions, though it’s up to the teacher to encourage that level of analysis, I think. Regarding what Howard said, I worry a little that this activity reinforces students’ misconception that a graph of motion is a picture of the path that the object took. You see this misconception in Function Carnival a lot. I agree that’s a risk. But I’m more inclined to offer students a variety of quadratic models rather than shy from any one model in particular. 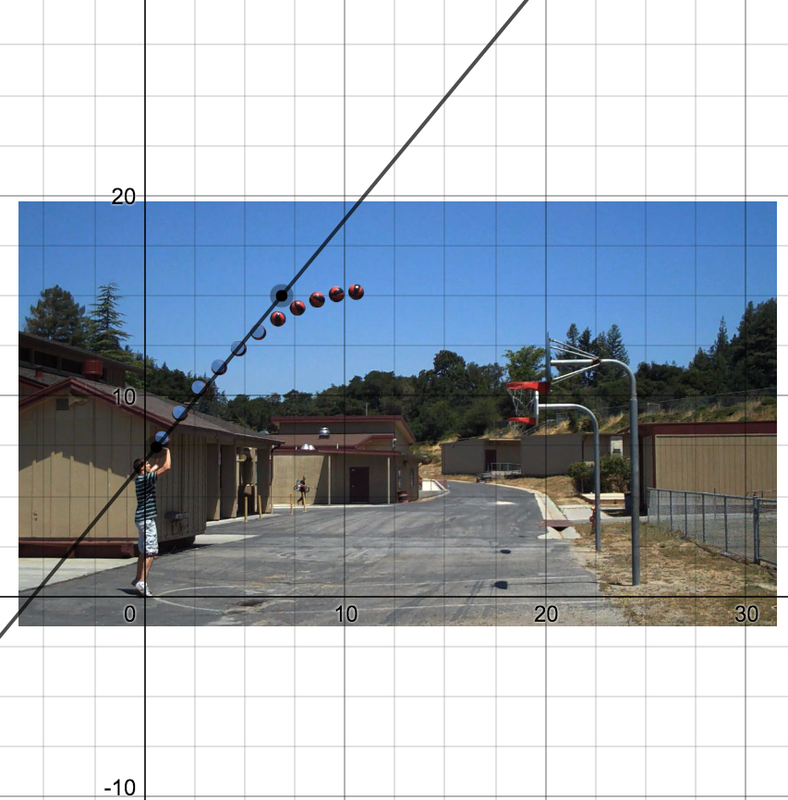 Students could be given the same type of basketball pictures without the draggable parabola and be asked to write their own equation that they think best matches the ball path. They can use their own graph to make their predictions. Yeah, I love it. I figured I’d use an activity like that towards the end of the unit. 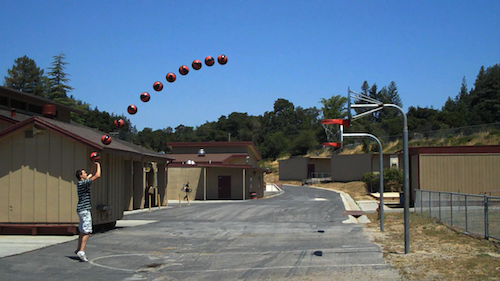 “Instead of fiddling, now deduce the model.” Last week I shot a bunch more basketball shots, though, so students wouldn’t invest the effort in shots they’ve already answered. Interesting questions from Kevin about the sequencing of this lesson. I think option (C) is closest to my route. We need this new model for reasons established in this activity. There are different algebraic forms of this new model. We need to put students into situations to understand when one form is more useful than another. The details of that plan are left as an exercise to … oh shoot – me. I have to figure this out now. Small typo introduced on Slide 4: “…which are useful” should be “is useful”, I think. Love this! I want to use this as a segway to derivative of the position, velocity for my students. Nice job on the re-work. Especially for reducing the height of the speed-bump that is technology that keeps some of my peers from using your materials. Will pass new version along to rest of my department. A nod to Dan here, I am using this lesson on Wednesday but having the students goto the gym with me for 10 minutes of class and filming some peers shooting basketballs. The iPad’s built movie function is very good at breaking a video down frame by frame. Students are attempting to take screen shots of the vertex and trying to model the parabola of the shot after we complete this lesson from someone’s airplay and slow motion on the board. Nice! Thanks for the update, Adam. Any thoughts about how you’ll generate the same kind of suspense? It seems to me that when they watch their peers shoot, they’ll know whether or not the ball goes in, which is the central question of my task. I borrowed the top picture in yhis post to illustrate the general equation s(t)=u*t-0.5g*t*t for my latest post. I did say where it came from.